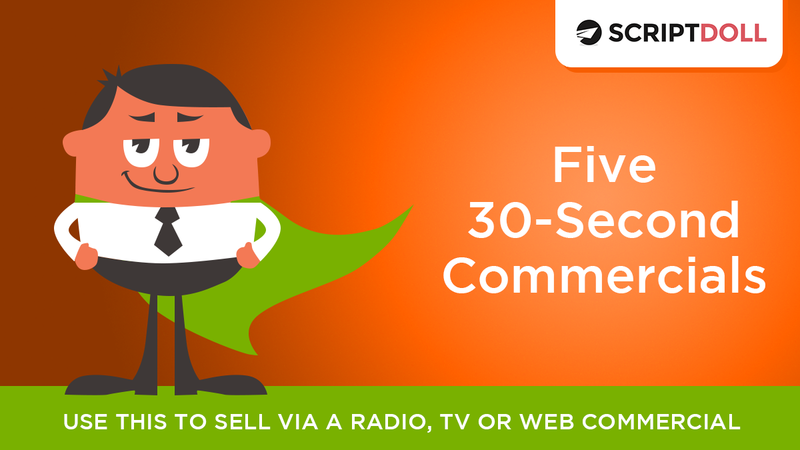 Five Fabulous 30-Second Commercials Scripts are now in ScriptDoll!! You’ve asked for more ads and ways to drive traffic so we’re giving them to you! These commercial scripts can be used immediately on radio so they are perfect for local offers. Grab a gig on Fiverr.com and get a video made for you commercial and post it everywhere from YouTube to Instagram to Facebook Ads or turn it into a TV commercial! Don’t have ScriptDoll? Try out all our great scripts for $1 today! [00:00:30] Hey guys! Monica here with ScriptDoll and I am so excited to show you our newest script. It is the five 30-second commercial scripts. You guys, this script is awesome. I’m gonna generate it real fast, then I’m gonna use our puppy training profile that we have set up for you. You guys, this script generates five different commercials that you can use anywhere. Radio, television, YouTube, Facebook, you can turn them into videos or you can just do audio, they’re really great. Here it is, commercials one, two, three, four and five. They look short but they are packed full of goodness. They’ve got calls to action, scarcity, all your fun things that you’ve put into your profile. You can always edit them right here in line. So, let’s just read this first one and make sure it makes sense. Sometimes you’ve got to fix those verbs and [inaudible 00:00:56]. [00:01:00] Tired of replacing all your things? You can trust my dog, you’re gonna want to say your dog, did not tear apart your home even when he’s left unattended and invest in high quality furniture without worrying that it will be torn apart. Make a change for the better. Download now, don’t wait because we’ll only be selling 10 copies. So you’re gonna want to go through and do all of that and then test it real fast to make sure you’re in the 30 seconds. Just hit the stop watch on your phone and read it out loud, kinda like this. In my best radio voice, I’m gonna give you commercial number one. All right, are you ready? [00:02:00] Tired of fixing and replacing all the chewed furniture in your home? Would you like to chew train a rambunctious six month old puppy effortlessly? You can. Introducing The Puppy Training guide. The Puppy Training Guide is a book that will help you stop a puppy from chewing everything in site. Using it, you can trust your dog not to tear apart your home, even when he’s left unattended. And you can invest in high quality furniture without worrying that will be torn apart. Make a change for the better. Download the book now. Don’t wait, because we will only be selling 10 copies. [00:02:30] Did you guys get that? As I read it I changed it up just a little bit more because it wasn’t making sense word for word on the page. So you might want to read it out loud and make sure that it flows. If you record yourself doing that then you can make the tweaks if you’re gonna give it to somebody else to record it. I have a little history, you guys may or may not know this but I actually used to work for Radio Disney in St. Louis and part of what I did there was read commercials. So, I do have a little training in this where you got my little entertained voice but it’s been a long time. [00:03:30] That is that and I want to let you guys know why I built this script. It was because you guys have been asking for ads and ways to drive traffic. We’re really trying to give that to you because we do listen here at ScriptDoll. So, if you’ve got an ad that you want to see, a set of ads or if you’ve got any other script type that you want, it’s up here. You can find this commercial script in the ad sections and go ahead and download it, use it and do all five of them. Do split testing. If you’re doing this on something that’s just audio, that’s super easy. Even video, you guys can get this script turned into a great little video and test to see what ads really nail this for your audience. Video’s where it’s at and that’s becoming more and more apparent. We’ve got actually this post here from the blog on Friday, how well the video sales letters work, incredibly well. Use these as videos and get going with all these great commercials that we have for you guys this month. Thanks for being a ScriptDoll user. If you don’t have ScriptDoll, you can get for $1 trial, just click the link below and you’ll be good to go.